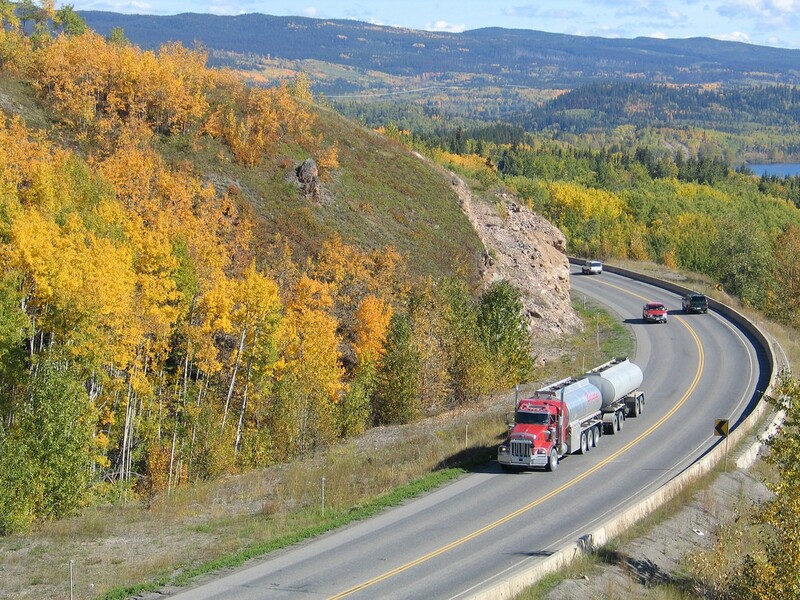 Transport trucks play a big role in getting goods to markets across British Columbia. While motorists travel on the same road as commercial transport vehicles, not all drivers are fully aware of who they are sharing the road with. Knowing the characteristics of large commercial vehicles, and how they operate, will help you stay safe on the road. The enormous size and weight of commercial vehicles mean they manoeuvre much differently than your passenger vehicle. And, what the truck driver sees from a transport truck cab is more limited than what you view from your cockpit. Given these contrasts, here are 10 ways for you to safely share the road with commercial vehicles. Stay out of the truck’s blind spots – Trucks have blind spots on all sides – front, rear and alongside. The driver can’t see you at all if you’re in front, close to their bumper, and especially if you’re near the right front bumper. They also can’t see you if you’re travelling closely behind, or in some spots beside the truck. If you keep your distance and allow lots of space between you and the truck, you can mostly avoid these blind spots. When passing (done on the left) keep moving. Mirrors will help you know if you’re clear of the blind spots. If you can see the truck’s side mirror when you’re behind the truck, the driver can see you. (Staying further back also provides a wider view of the road ahead.) When in front of a truck, be sure you can see the truck’s windshield, in your rear view mirror. It’s best to travel on the left side of the truck (though, if possible, don’t linger there). Don’t cut in front – Transport trucks have a lot of weight behind them. It takes a lot longer for a 40,000-kilogram load to stop than it does for any private passenger vehicle. So, don’t cut in front of a truck, because the driver may not see you (due to the blind spots mentioned above) and if you need to suddenly stop, even if they know you’re there, they can’t stop as quickly as you.It’s especially important to never, ever zip in front of a truck just before a traffic signal. The light could turn red, and you may reduce the space that the driver has allowed themselves for stopping. Allow loads of room for passing – Check out how long the load is before you decide to pass – some trucks pull two trailers. Be sure you’ve got lots of room and time to travel the length of the load and don’t pull back into the lane, until you can see the truck’s windshield in your rear view mirror. Give oversize loads extra respect (and space) – A truck or pilot car with a sign that says “Wide Load,” “Long Load” or “Oversize Load” means they may travel slowly, and extra caution and patience are needed. (And you might get to see something really cool being moved – like a gigantic windmill blade or a house!) Check out these tips and never follow a pilot car when it’s passing the load. Stay out of the squeeze – Being long, trucks and their loads need more room to pivot. When turning right, the truck may swing wide into the lane beside, and motorists might mistakenly think that the right lane has become available. But the gap is only temporary, and as the trailer travels around the corner, it returns to the right lane. If motorists decide to come up alongside the truck in that right lane, they can get “squeezed” between the trailer and the curb. (Not a nice, friendly squeeze! 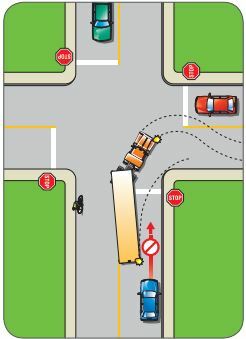 )A similar situation (without “the squeeze”) can happen when a truck is turning left, and there are two lanes going in the same direction. Do not come alongside the left side of the truck, as it travels to the right. 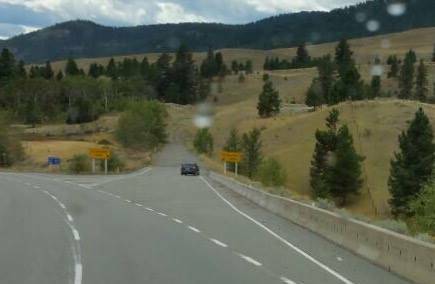 The truck will be re-occupying the left lane.“SQUEEZE” A HAZARD FOR CYCLISTS AND PEDESTRIANS TOOCyclists, be cautious when riding or stopping beside a truck that is turning right – the driver may not know you’re there. Move a few feet from the road, or go up on the curb to allow some breathing room. Pedestrians standing at the corner of an intersection are vulnerable if the trailer creeps onto the shoulder. Stand back from the roadway and keep your eyes on the traffic. Tune into turbulence – Yes, you already have your seatbelt fastened, but did you consider how large transport trucks in motion create wind currents and changes in air pressure? Turbulence can make it more difficult to control your vehicle, especially on slippery roads. Motorists hauling trailers or campers, and motorcyclists, are especially affected. Whenever trucks are coming or going near you, keep a firm hold of your steering wheel. Watch for heavy weather – In nasty weather, big trucks may throw extra snow, mud, rain and slush onto your windshield and obscure the view ahead. Beware the roll – When a truck that is facing uphill releases its brakes, the truck may roll backwards a bit before moving ahead. Allow some extra space for this when you are behind a stopped truck. Provide lots of advanced notice and room – Given the restricted view of the truck driver, and the greater stopping distance needed by trucks, let them know what you’re up to. Signal early and follow four seconds behind. 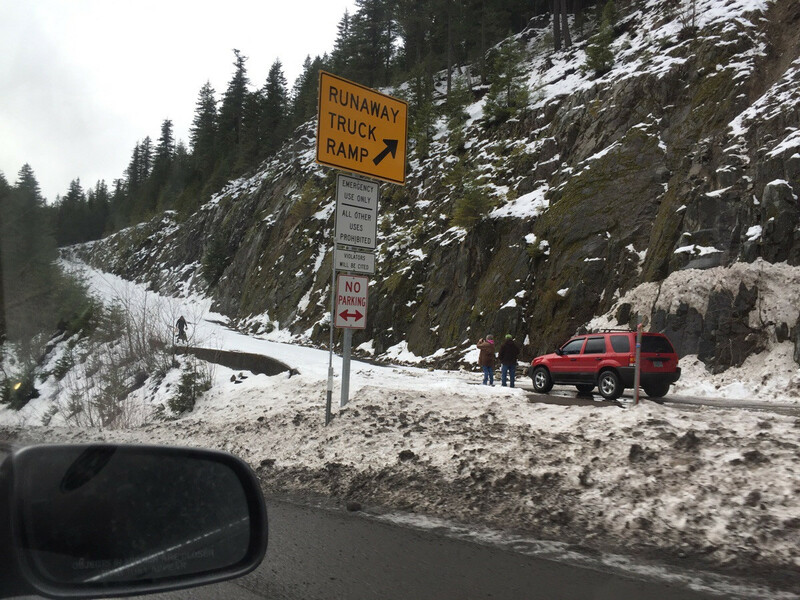 Keep out of runaway lanes – When heavy trucks going down certain BC mountain roads find themselves out of control, they can take runaway lanes to prevent a crash (and possibly save their lives and the lives of others). So, NEVER stop in a runaway lane – they are emergency exits for the sole use of commercial truck drivers. There are a surprising number of motorists who block runaway lanes, to take a break, pull out a picnic or even go tobogganing. Consider the needs of truckers, who work long, unpredictable hours in often trying conditions…Please do not park in spaces designed for commercial vehicles. 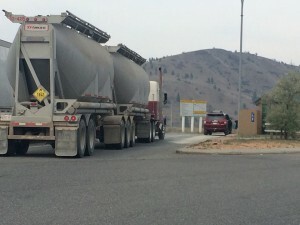 Drivers of big rigs need room to park, conduct brake checks, take their required rest breaks, stop at vehicle inspection stations, and then pull forward smoothly to hit the road again. If you need to park at a pullout, please park to the far right near the exit, so that you’re not blocking the way for large trucks to come and go. We ask that you not use the facilities at vehicle inspection stations, but instead stop at our highway rest areas. Despite their different-sized vehicles, truck drivers and non-commercial drivers have a shared interest in getting to their destinations safely. By following the tips above, you can help keep everyone’s driver stress levels in check, and help truckers deliver their goods and keep our economy moving. Thank you to Kristin McCallum for contributing the photos of passenger vehicles parked where they should not be. Thanks also to Kym Dèscentè and Kristin for supplying the link to the “tobogganing” photo, and to Jackie Hendrix for sharing her top concerns. Illustrations are courtesy of ICBC. GREAT Work..!! I Appreciate your work, It will helpful for everyone. thanks for sharing this post with us. This is truly very informative post to learn great things about transport trucks. Nice suggested steps to discover about road safety. Thanks Kamal! We’re glad you found the information interesting and useful. Thank you for suggesting that you should always allow room for passing when it comes to commercial trucks. Transporting with semi trucks seems like a very convenient way for businesses to get their products across the country. Hopefully, they look into finding the best transport companies. If truck drivers can be charged for following too close, why is there no law prohibiting car drivers from pulling into a trucks stopping space?? I feel that this should be taught to all vehicle drivers when they are tested for there license. Thanks for your question/suggestion about laws for drivers pulling into a truck’s stopping space. Contact information for that agency can also be found at the website. While all the points are really important, the blind spot is what everyone should be most aware of. A lot of accidents happen due to cars being in the blind spot. It’s always important to keep distance for the safety of everyone in the road during that situation. Thanks for your comment John – we really appreciate it. Great post! You have discussed some really great info about driving around heavy transports! Practicing precaution and following these tips seems like the best way to stay safe and be courteous to truck drivers! Thanks for sharing! Trucks in BC are allowed to carry significantly more weight then in Washington State to the south. Also drivers are allowed to drive for longer periods of time. One of my friends has been in the trucking business for a couple of years, and he has spoken about how people will try to pass him when they really shouldn’t. The result sounds terrifying, for both the truck driver and the other driver. Practicing precaution and following these tips seems like the best way to stay safe and be courteous to truck drivers! Thanks for sharing! Thanks for sharing your insight, Rachel. And thanks for the kudos. We’re really glad you feel the blog will be helpful/useful. Never rely on other drivers to stay out of your blind spots; they may not be aware of the size of your vehicle’s no zone. Check your mirrors every 5-8 seconds as well as before you change lanes, turn or merge. This will help you keep track of changing traffic patterns around your truck. Wow, this is some really great info about driving around heavy transports! I had no idea their blind spots were so big, I always assumed the extra mirrors corrected for that. I’ll have to be a little more careful on my way to work every day, as I usually drive past three of four of these big transports a day. Thanks so much for writing, I’ll have to send this to my carpool co-drivers! Glad to hear you liked it Paul and thanks for sharing! Thank you for this great article! Good suggestion by Lroff. Also, if this information is not included in the BC driver’s license learners manual it should be, as well as people tested on it to show that the new driver understands that they have to share the road. Seems there is not enough emphasis on safe driving with the new drivers these days, by observations. Thanks again! Suggest this be posted to the Tourism BC twitter and websites as well. Out of province visitors may not know how to deal with this situation. A great idea Lindley – thank you for connecting with us on this.